I love Christmas…and I love all things that come from the kitchen at Christmas time. There is something magical about the wafting fragrance of spices and cookies and roasting meats! There is great fun in all the work of preparing for guests to join in the celebration. I love getting the candles ready, the glasses polished, the cloths ironed and the food all just right. I love an array of homemade gifts, wrapped beautifully and with care, all just waiting for their recipients to see. I love Christmas morning, the madness of the unwrapping, the lull afterwards as preparations for something wonderful for breakfast are finished off. With my collection of festive recipes for this Christmas, you should find the Season a little less hectic, a little more fun and certainly filled with lots of flavour! I would love to do a full sized Celebration book, and perhaps one day I will, but in the meantime, this is just an example of what may come. Please join with me this year in having beautiful food on your table and as gourmet gifts for your friends and family, not to mention a little something for yourself! Enjoy the recipes, enjoy the festivities and may Santa bring you just what you want. So crank the carols, get in the kitchen and start your engines. 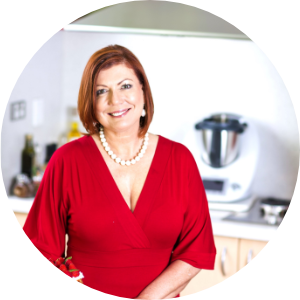 "I have recently purchased both the ebook " What's for dessert" and cookbook " For Foods Sake".. These are the books I have been longing for since I purchased my Thermomix just over 2 years ago! Delicious , achievable recipes, that also have me exploring a few new things I hadnt considered making before eg, Umami paste and powered malt. I would purchase any book from Tenina without hesitation! Thanks so much! "